I always get confused between kichadi and pachadi. The only difference I could find is that, for kichadi, you have to fry the veggies and for pachadi, you have to cook them adding water. If any of you know other reasons for calling them by different names do let us know. These are all simple dishes that goes on our tables everyday and since we have been on a effort to cover exhaustive everyday meals at home here is another one. 1.Chop the bittergourd and green chillies thin and fine. 3.Grind the coconut and cumin together to a fine paste.Crush the mustard seeds. 4.Heat oil in a pan and do the seasoning.Add the coconut mixture and crushed mustards and saute till all the water is absorbed. 5.Take the fried bittergourd in a mixing bowl and crush them a bit.To this add the sauteed coconut mix and yogurt and mix well. Look at that click,who will say no to this pavakka kichadi, not me,feel like grabbing the bowl and finishing rite now...awesome dish!! That's one lovely dish with perfectly tempting picture and a different way to eat the bitter gourd. Never tried the Japanese melon. Thanks for the picture Namitha, will try to buy in this the next time I hit the grocers. The kichdi is going places with bitter gourd. Seriously, love this spin on Kichidi. Will definitely try this! This recipe would come in handy as I am into eating bitter gourd these days! Looks lovely! Nice recipe with bittergourd. Hey Nami...Kichadiyil kadukkum koode arakum with coconut, pachadiyil athilla..athalle difference..
Looks soo good ketto....pavalkka njgalude fav ane..
had no idea that Bittergroud Khichdi looks so nice. Very Good Clicks. Beautiful clicks!! Pavakka kichadi is our fav..
For us pachadi is yogurt based dish and Kichadi is rice based dish. Kichadi/pachadi looks delish with bittegourd..
Pavakka pachadi looks really good. yummy! Bitter gourds are not easy to find here...really want to try it. Lovely healthy dish and beautiful click too. Hi Gulmohar pachadi ka bhai khichadi.Your bittergourd khichadi looks yum and delicious. Khichdi looks delicious, creamy and tempting. Thanks for this wonderful recipe. i rarely cook bitter gourd. this one is worth trying. I have never had gourd or bitter gourd. The photos are awesome, as usual! I would love to try it. Very beautiful clicks... healthy pachadi. I usually do not cook bitter gourd but if you add coconut to it, I will change my mind..Looks good, new one instead of the usual thorans. ... hated bittergd when I was a child.now one of my favorites. I like the mezhukkupuratti more though. Nice recipe. Looks so yum! In tamil we always refer pachadi to raita and khichadi to vermicilli upma...just kidding i know its different in Malayalam,wish i knew.Love the feast u guys have been posting lately. Excellent pictures asusual.. lovely dish. Love your Pachadi! I'm saying 'pachadi', cos, from what I know, Kichadi is normally made with rice/broken wheat or some whole grain, in addition to vegetables which may sometimes be optional; usually kichadi is main course. On the other hand, Pachadi is like a side dish which is made with veggies/fruits, or even a combo of the two, and is usually an accompaniment. Like, Maangai pachadi, which is a side dish when you make koottu or avial. There are even raw pachadis which do not involve cooking. Even raitas are referred to as pachadis by some people. Well, so these were my two cents' worth :) Hope it helps! 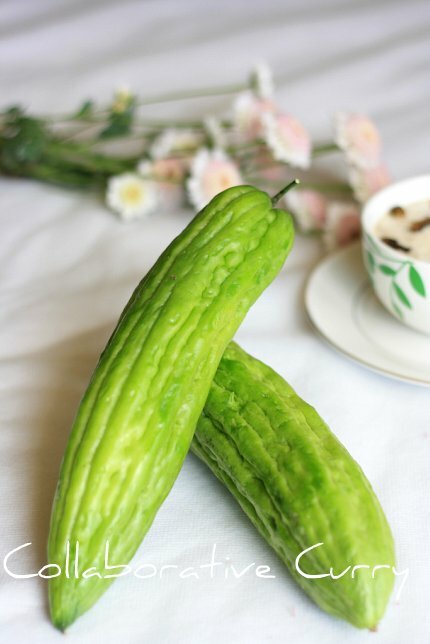 I have started loving bitter gourd only of late after knowing its health benefits. very true if you fry it in oil it is not that bitter. I now got another recipe with this bittergourd. But this one is very delectable! Simple and nice, never used bittergourd this way but seeing the pic would surely say its yummy..
good one...very awesome looking too...i make this too! Nice pics of a healthy dish. Something new for me. i wish this was an everyday component of my meals! it sounds great with the kick from the chillies and the lovely mustard and coconut flavors--thanks for sharing this! I would love to try this dish since it's so different from anything I've ever had before. Looks delicious! Not so fond of bittergourd. Khichdi's nutritious. Nice recipe with bittergourd, looks yummy. Liked that bowl. Oh loe this dish, still i couldn't figure out the diff btwn kichadi and pachadi. We call all these kichadi and anything with turmeric as pachadi. Well what's in a name rt? Very intriguing recipe, I need to pick up Bitter Gourd and try this! 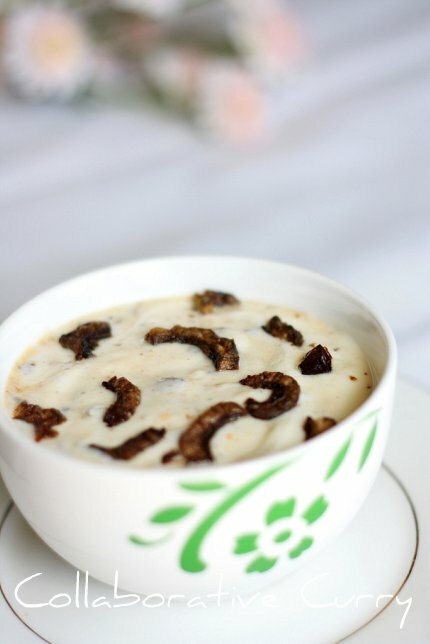 Pavakka Kichadi is a wonderful recipe... never tried it with Japanese bitter melon..Thanks for sharing..
Pachadi is yogurt based and kichadi is yogurt and coconut based in Kerala at least. That is one difference I know. In one vegetables are fired and in the other boiled is another difference. But I get confused with what is puliseri then. that is also yougurt and coconut based.